How do I set up House Keeping options in SQL-RD? In this section, we will talk about the various housekeeping options available to you in SQL-RD: Components and Folder Housekeeping. These options allow you to manage settings that help you manage the resources SQL-RD works with. From time to time, the main DLLs required to run SQL-RD successfully will need to be re-registered into your system registry. This need may arise as a result of the install or uninstall process of other applications you may be running on your PC. During the component re-registering process, you must ensure that you are logged into the PC as the Local Administrator in order to ensure that you have full security rights to the complete system registry. From the list that presents, select the component you wish to re-register. Depending on the version of SQL-RD you have, you may not have all components in the list. Do not worry. Only components relevant to the version of SQL-RD you are running will appear. Once the component has been re-registered, restart the PC to ensure that the new settings are stored by Windows. 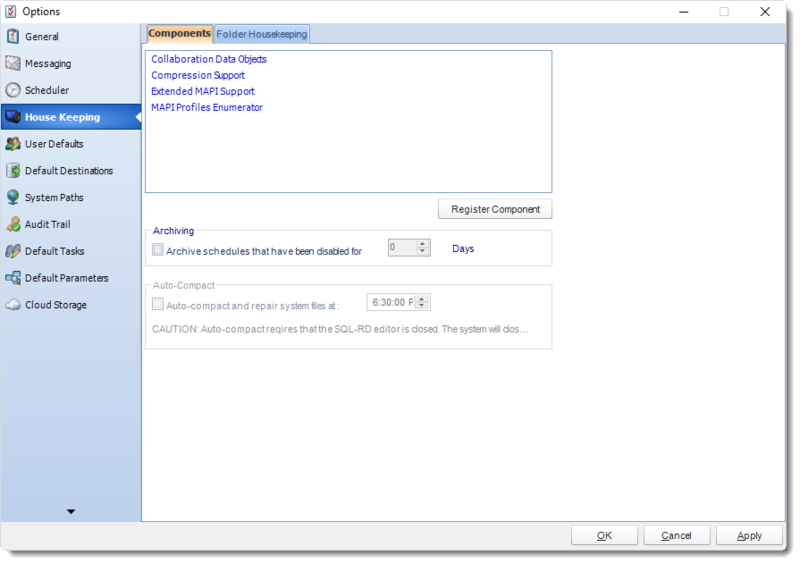 SQL-RD allows you the option to move disabled schedules to an Archive folder. Schedules moved to the Archive folder can be enabled again and moved to other folders, but this option keeps folders neat and easier to manage. Check Archive schedules that have been disabled for. Specify the number of days a disabled schedule can remain at its current location before being moved to the archive folder. Folder housekeeping is a great way to stop your destination folders from getting too full. Different from the folder housekeeping option found in a schedule, this option can monitor any folder and delete items older than a specified time. Folder Housekeeping is run using the system maintenance thread which runs every 5 to 10 minutes. Click green plus button to add a new folder path. Click (...) button and navigate to the specific folder you wish to monitor. Once you have selected the folder you wish to monitor, indicate how old items in the folder should be before they are deleted. If you want to immediately delete all items in the folder that are older than the specified value, click Purge. Otherwise, click OK.
Click Apply at the bottom of the Options window. 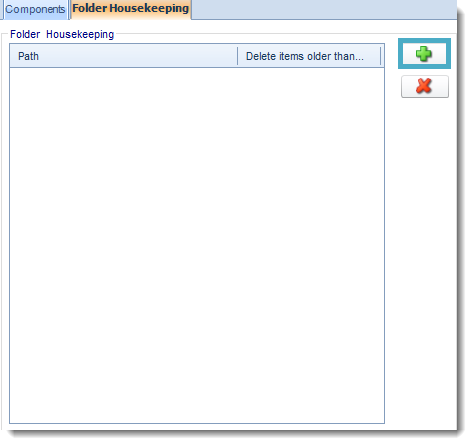 You can delete a housekeeping item by selecting the folder path, then clicking the red X button.